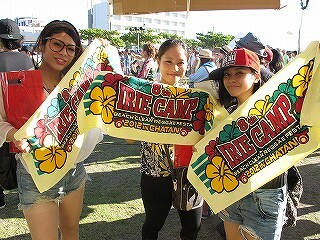 Irie Camp is Okinawa’s largest reggae festival that attracts local reggae musicians as well as fans from far and wide to Baba Park in Sunabe. The Irie Camp Beach Clean Reggae Festa is coming up a week from Sunday, with plenty of fantastic music, but it’s a working participation event. The June 30th event begins at 1 p.m. with a Beach Cleaning at Sunabe Baba Park, Sunabe, Chatan. Once the work’s done, the musical fun part of the event kicks off at 2 p.m. and runs non-stop to 8 p.m. Performers will be Peterman, Chehon, Natural Weapon Tak-Z, U-Dou&Platy, Newman, Deki-T, 45 from Jammin, Godmaking, DJ Task, Simpson, Precius, Ryukyu and Hai-sai. More than 2,000 enthusiastic fans attended last year’s Irie Camp Reggae Festival and beach cleaning event, and this year’s attendance is expected to be even bigger. This is a beach-cleaning and outdoor reggae. More than 2,000 people attended this exciting outdoor festival last year. Musicians and reggae DJs from all over Japan come together on the biggest reggae event in Okinawa. Organizers have tailored this festival to emphasize the importance of sea and seashore in Okinawa to many people through music or the beach cleaning activity. It’s also a field festival on Sunday, designed to attract families as well as couples. With the rainy season already ended on Okinawa this year and summer already here, it promises to be a festive Sunday.